Google dominates the World Wide Web. There was never an election to determine the Web's rulers. No state appointed Google its proxy, its proconsul, or viceroy. Google just stepped into the void when no other authority was willing or able to make the Web stable, usable, and trustworthy. This was a quite necessary step at the time. 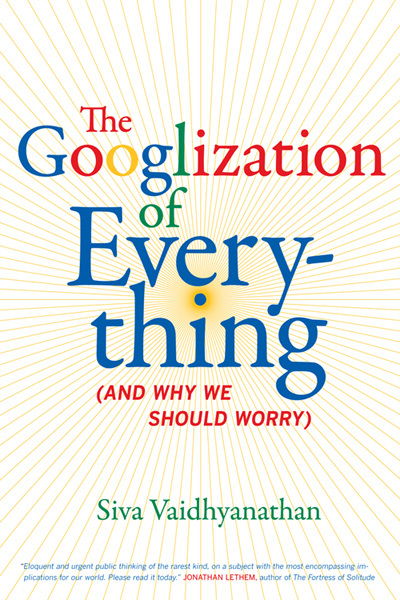 The question is whether Google's dominance is the best situation for the future of our information ecosystem. In the early days it was easy to assume that the Web, and the Internet of which the Web is a part, was ungoverned and ungovernable. It was supposed to be a perfect libertarian space, free and open to all voices, unconstrained by the conventions and norms of the real world, and certainly beyond the scope of traditional powers of the state. But we now know that the Internet is not as wild and ungoverned as we might have naively assumed back at its conception. Not only does law matter online, but the specifics of the Internet's design or "architecture" influence how the Web works and how people behave with it. Like Jessica Rabbit in the film Who Framed Roger Rabbit, the Internet is not bad-it's just drawn that way. Still, architecture and state-generated law govern imperfectly. In the People's Republic of China, the state clearly runs the Web. In Russia, no one does. States such as Germany, France, Italy, and Brazil have found some ways to govern over and above Google's influence. But overall, no single state, firm, or institution in the world has as much power over Web-based activity as Google does. So Google, which rules by the power of convenience, comfort, and trust, has assumed control, much as Julius Caesar did in Rome in 48 B.C. Before Caesar, there was chaos and civil war, presided over by weak, ineffective leaders who failed to capture the support of the people or to make Rome livable. Like Caesar, Google has found its mandate to rule through vast popular support, even in the absence of a referendum. And like Caesar's, Google's appeal is almost divine. Because we focus so much on the miracles of Google, we are too often blind to the ways in which Google exerts control over its domain. Siva Vaidhyanathan is a cultural historian and media scholar, and is currently a professor of media studies at the University of Virginia. From 1999 through the summer of 2007 he worked in the Department of Culture and Communication at New York University. Vaidhyanathan is a frequent contributor on media and cultural issues in various periodicals including The Chronicle of Higher Education, New York Times Magazine, The Nation, and Salon.com, and he maintains a blog, www.googlizationofeverything.com. He is a frequent contributor to National Public Radio and to MSNBC.COM and has appeared in a segment of "The Daily Show" with Jon Stewart. Vaidhyanathan is a fellow of the New York Institute for the Humanities and the Institute for the Future of the Book. He is noted for opposing the Google Books scanning project on copyright grounds. He has published the opinion, that the project poses a danger for the doctrine of fair use, because the fair use claims are arguably so excessive that it may cause judicial limitation of that right. Vaidhyanathan was born in Buffalo, New York, and attended the University of Texas at Austin, earning both a B.A. in History and a Ph.D. in American Studies.